Mumbai-Goa Highway and Mumbai-Pune Expressway have been in news over the last few years for severe accidents resulting in many deaths. It is time we made these connections safer. Vidyottama Sharma on the causes of accidents and possible remedies. April 25, 2013: Four people, including three women, died and a woman injured in Raigad district, 140km from Mumbai, when a tanker collided with a Swift car. Both the vehicles were moving in opposite directions. March 25, 2013: Three people died and many were injured in Raigad District when two vehicles moving in opposite directions collided with each other. The accident occurred only six days after an earlier one. March 19, 2013: At least 37 people were killed and many injured when a Mumbai-bound luxury bus from Goa plunged into the Jagbudi river in Khed, Ratnagiri District from a height of 40ft at about 3.30am. The driver lost control of the bus while negotiating a steep turn. These are just three accidents but according to a rough estimate, over 7500 accidents have taken place on Mumbai-Goa Highway between 2006 and 2012. March 28, 2013: 27 people were killed and an equal number injured when a speeding auto rammed into a stationary bus in the early morning of March 28. Due to a tyre burst, the bus was parked on the roadside with another bus parked behind it in order to help out with the repair work. An over-speeding auto lost control and rammed into the second mini bus from behind. People seated on the road between both the vehicles were crushed. March 04, 2013: Seven persons were killed and a few injured when a Tata Sumo, en route to Thane from Karad, hit a vehicle on the Mumbai-Pune Expressway. January 28, 2013: Five people died and two were injured when the driver of the car they were travelling in lost control due to over speeding, jumped the median and crashed into a van that was going in the opposite direction at Kamshet. Three accidents had already taken place on the Expressway in the same month before this accident. The accidents were all caused by over speeding drivers who jumped the poorly barricaded dividers. September, 2012: Two Marathi actors, Anand Abhyankar and Akshay Pendse, lost their lives and six people were injured within two days ? Sept 3 and 4. The injured included the deputy district collector of Sindhudurg and two Korean nationals. What is it about the 540km long Mumbai-Goa Highway and 95km long Mumbai-Pune Expressway that, despite accident after accident over the years, we have not been able to assure safety of their users? What are the reasons behind these accidents? ?Primarily over-speeding and lack of quality safety restraint systems?, say the experts and the industry in one voice. ?Drivers have to watch their speed on the highway / expressway.? And then, of course there are other issues like the missing medians / dividers, tyre bursts, overloading of vehicles, blind turns, uneven surface on Mumbai Goa Highway, overtaking at night; not maintaining front and rear lights / reflectors, unwanted use of high beam, lack of Cats Eye in most places and fatigued drivers. The most important reason, though, is over speeding. Quite often, the drivers over-speed because the stretches on either side of the toll plaza are laid straight and the thrill of driving fast (which the congested city roads do not permit) is too hard to resist. Spending a few crores on roads is not a big thing as these will save too many lives. Right away, short term methods must be adopted for Mumbai-Goa highway because constructing four lanes will take at least four to five years since land acquisition is a major problem. ?The traffic on the Mumbai-Goa Highway is totally unsustainable due to its volume and heterogeneous nature. Goods and passengers move on it day and night and though their volume is high, there are no medians or road dividers. So, at night the light of the trucks/ buses/ cars blind the eyes of the drivers moving on the opposite side. High volume roads must always have dividers. That road is an invitation to accidents,? says Ashok Datar, Chairman, Mumbai Environmental Social Network. The dividers / medians on the Highways / Expressways are often missing or aren?t high enough to stop a vehicle from crossing over to the other side in case of a heavy impact. Also, there are gaps in medians that allow the two wheelers to cross over to the other side. Until good roads are made, nothing much can be expected. The Mumbai-Goa Highway has hilly terrains, blind turns and dangerous curves. On it, more than 100 spots have been identified as accident-prone. Hence, transport experts and travellers alike have been demanding that the road be widened to four lanes. It is being done on a 84km stretch though ? from Palaspe to Indapur. Datar too recommends four lane roads and constructing one-and-a-half metre wide medians to dilute night blindness: ?This road should be a proper four lane median-divided highway ? it must be completely separated by a wide median. The gap should be filled with shrubbery. At present, the lanes are divided only by white lines.? He adds, ?Spending a few crores on roads is not a big thing as these will save too many lives. Right away, short term methods must be adopted for this highway because constructing four lanes will take at least four to five years since land acquisition is a major problem.? He is also of the view that rumbling sticks – that make the road uneven ? must be constructed before dangerous spots to reduce speed. He blames bad driving behaviour too for the accidents. ?As the speed increases, your vision gets narrower ? it becomes more like a tunnel vision,? he says. Instead of the speed breakers, the speed must be controlled through toll plazas. The time between two toll plazas must be recorded and defaulters must be asked to pay stiff fines depending upon how much quickly they have covered the distance than the stipulated timing. Sudhir Badami, Transportation Analyst who is on Government of Maharashtra?s Steering Committee on BRTS for Mumbai and Mumbai Metropolitan Region Development Authority?s Technical Advisory Committee on BRTS for Mumbai, opines, ?Modern cars are much quicker on the pick-up and give a greater sense of security than the earlier 800cc cars. This lends misplaced courage to the drivers who drive rash and at high speed, often attempting to overtake without considering the position and safety of other equally fast cars. Traffic is fast-moving and heavy even for the 3+3 lane expressway on Mumbai-Pune Expressway, and heavy on the Mumbai-Goa Highway (NH-17) on the 2+2 lanes. 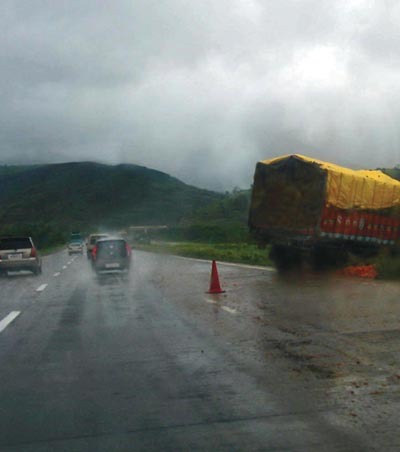 NH-17 passes through towns and some villages, enhancing possibilities of mishap occurrences?. Badami offers a remedy here. He says, ?Instead of the speed breakers, the speed must be controlled through toll plazas. The time between two toll plazas must be recorded and defaulters must be asked to pay stiff fines depending upon how much quickly they have covered the distance than the stipulated timing. They should be made to spend at least three times the time gained or 15 minutes, whichever is higher. It is hoped that thus, people will keep speed within limits and avoid rash overtaking, thereby averting mishaps?. The Fracasso crash tested barriers conforming to the European Standards EN 1317 perform well for a 900kg car and or/ 13 tonne bus and up to a 38 tonne truck. It means since every road has vehicles from the smallest car to the heaviest truck, a barrier should be able to do justice to all. A rigid barrier will prove extremely harmful to the occupants of a small car in case of a hit. The barriers manufactured by Fracasso are designed to provide safety to every vehicle ? whatever the weight. A crash tested barrier can reduce accidents dramatically, completely preventing vaulting over of vehicles. In Europe, crash tested barriers make all the difference. But the barriers installed on Indian highways / expressways leave a lot to be desired. Says Rajaram Subramaniam, COO, Metalmeccanica Fracasso India Pvt Ltd, ?The barriers installed on these highways are metal crash barriers ? untested for performance. As they are not performance-tested, they do not function well. These are not the right type of barriers that must be installed at such heavy traffic highways. The need of the hour is to install crash tested barriers.? He adds, ?We are still installing primitive barriers on Indian highways; the designs are around 30 years old. These barriers are just physical barriers but in terms of performance, they do not live up to the purpose for which they have been installed. They work satisfactorily in low speed situations but on expressways, you need real performing barriers. ?